Live colourfully: Take Jonathan Adler home TODAY! 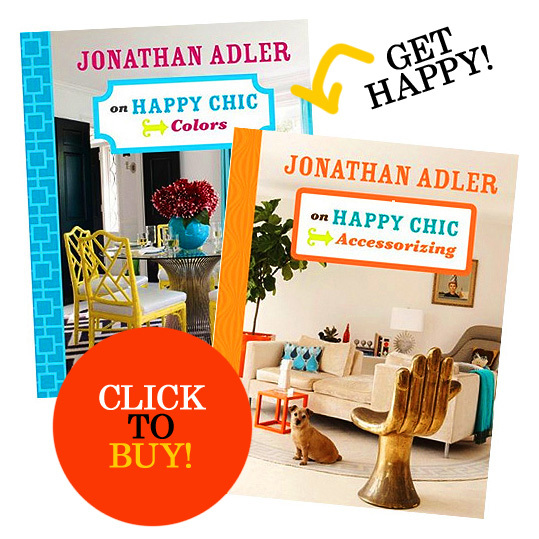 I recently bought 2 of Jonathan Adler's books, "Happy Chic Colors" and Happy Chic Accessorizing". Less than an hour after I had flicked through them, I was on the phone to the Australian distributor - I had to have them in the Table Tonic Shop! They are beautiful inside - screaming with colour, pattern and lots of clever tricks and ideas. And pssssst! You can now buy them online from tabletonic.com.au as well! Good day! My wife and I often write guest articles for other blog site owners to help gain publicity to our work, as well as provide fantastic content to site owners. It's a win win situation! If you are interested feel free to email me at: celestemcgrath@web.de so we may talk further. Cheers! work? I've very little expertise in coding however I was hoping to start my own blog soon. Anyway, should you have any suggestions or techniques for new blog owners please share. I know this is off topic nevertheless I simply wanted to ask. Thanks a lot! Hi! I hope you don't mind but I decided to publish your site: http://www.blogger.com/comment.g?blogID=1178957263222092897&postID=971198644882561021 to my on-line directory. I used, "Blogger: Table Tonic" as your blog title. I hope this is ok with you. If you'd like me to change the title or remove it completely, email me at katricegoldstein@yahoo. Hello! You some sort of skilled? Great message. Can you tell me find out how to subscribe your weblog? Hi there colleagues, nice piece of writing and good urging commented here, I am genuinely enjoying by these.